One True Media ?Video Clips? : Series of TV interviews, live performances, youngest fan, Bruce Hornsby relationship and more. Editing in house (CJP-NHRecords) of video of Nikki Hornsby performing her music from TV Spain & Radio throughout Europe available soon. Book mark this webpage and return to see the link to view. (1) 2012 MUZAK has signed licensing agreement 30 releases of Nikki Hornsby Music http://www.muzak.com/products/music. ? ?Serves approximately 335,000 client locations in the US and 14 foreign countries, and more than 100 million people hear MUZAK programs each day?? 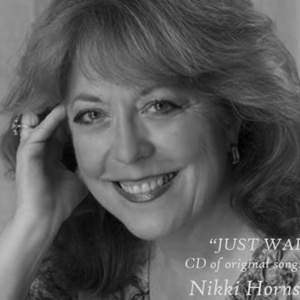 Keep listening for Nikki Hornsby music playing in your malls & offices where ever you are! (2) Canadian Magazine Reviews "Just Wait" http://is.gd/SHLIyp Don Graham says "This is definitely a CD worth having in your collection and for listening to beginning to end in your car or sitting at home on a day of reflection. And as Hornsby says on track 8 you'll get your ?Money's Worth .? "One Way Ticket" released in late 80s #1 in Spain printed in ACM Newsletter and found verification photo online http://is.gd/8TzN1H www.cjp-nhrecords.com page 9. Nikki Hornsby is a grammy voting member, full time professional business woman & musician, singer songwriter artist. 2011 Single song from "Just Wait" CD called "Flyin Over Sweet Alabama" has been placed on country countdown Cashbox Magazine. 2010-2012 Nikki Hornsby finally has written more original music: "Have I Told You Lately", "Feeling Kinda Lonesome Lately", and "Know Where You're Going", "Fall from Grace" BMI (p) (c) plus more to add to her large catalog of hundreds of live marketed tested Pop to Spanish, German original songs waiting for funding to be recorded. Made available for leasing by CJP-NHRecords with the help of CJP-NHRecords Specialists project (www.cjpnhrecords.blogspot.com) for leasing worldwide to other artists or TV and movie uses. CJP-NHRecords Released ?Just Wait Instrumentally? music from prior release w/o words by Nikki Hornsby. Wikipedia has a full biography online http://www.en.wikipedia.org/wiki/Nikki_Hornsby Nikki Hornsby's grandfather here is finally getting noticed for all he contributed to the music recording industry long before Nikki was born. It's an inheritance she knows as a responsibility to share. Fact of major accidents over 2007 to 2010 slowed down Nikki Hornsby's career & her work progress. Many CJP-NHRecords projects for this honest business woman were held back. Living alone has not stopped her regardless nor has she used the major injuries from international airline, car broadsided accident, ripped stomach lining, etc. as news to sell her products anywhere. She is healing and regaining in time all the money lost from all these misfortunes. 2005 - 2006 into 2007 Traveling throughout Europe test marketing her songs for "JUST WAIT" CD release which was made to lease to other artists in USA & Worldwide. Nikki Hornsby was politically representing her country & her own company CJP-NHRecords towards future planned international projects. Letters of recommendation in this regard. TV & Radio & scheduled Interviews in Europe & Mallorca Spain with Radio online & off line charting of her songs from ?Just Wait? CD found online http://cjp-nhrecords.com/12_-_testimonals . International Automobile Association appearance on Truck Radio with TV IAA interview and broadcast all over Europe. Her previous releases that charted in Europe in 90s were also broadcast with the test marketing of her newest releases. Nikki continues to write new songs to add to her large catalog of over 200 original songs. All her material she performs live in concert, clubs, showcases or at many social functions thus test marketing for the audience response still persistently traveling her path toward making more recorded product with numerous independent accomplishments. But as those who have known Nikki for many years, she has never forgotten the real good people who have truly supported her efforts all along the path of making music Nikki was born to follow and lead. Her character in business, her moral values, and practiced ethics prove "there is more to lovin than saying you do" from Momma's Blues. Listen to see if you can hear this in her voice in her music and ask anyone who has had the opportunity to meet this exceptional talented business woman.